Experience something new, fun & exhiting - 7 people on 1 bike! Ride with us through the old ancient streets of Prague on this modern spider like machine. Guided tour in English through Old Prague & Jewish Quarter starts every hour. 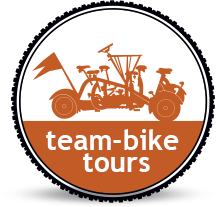 Ride together through old city and along the Vltava river! This 45 min exiting ride takes you through Old area of Prague and down along the river Vltava bank with ever beautiful views of Letna park and Prague Castle.